Tradingene – First marketplace of trading algorithms. a large number of “garbage” strategies and algorithms designed to defraud investors. 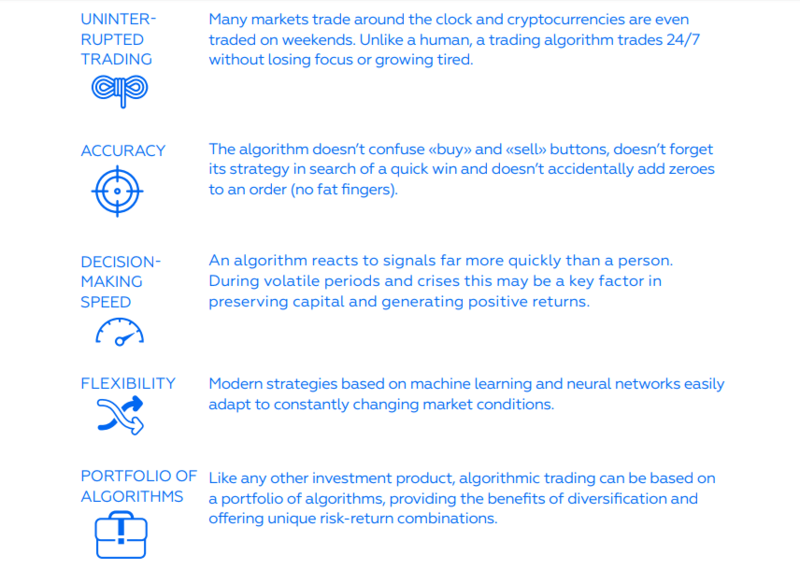 In short, algorithmic trading is not accessible to a wide range of investors on cryptocurrency and other markets. TRADINGENE IS A BLOCKCHAIN-BASED AUCTION PLATFORM THAT MAKES POSSIBLE THE CREATION AND USE OF ALGORITHMS TO TRADE CRYPTOCURRENCY AND THE MOST POPULAR FINANCIAL INSTRUMENTS. TRADINGENE ADDRESSES THE AFOREMENTIONED PROBLEMS THROUGH AN ACCESSIBLE, TECHNOLOGICALLY ADVANCED, EASY-TO USE WEB PLATFORM FOR CREATING AND TESTING ALGORITHMS; ONLINE COURSES FOR ALGORITHM CREATORS; COMPETITIVE AUCTIONS FOR ALGORITHMS; AND A BLOCKCHAINBASED SYSTEM TO RECORD AUCTION RESULTS AND CONCLUDE SMART CONTRACTS BETWEEN ALGORITHM CREATORS AND INVESTORS. Tradingene will make algorithmic trading accessible, transparent and equitable. Tradingene provides investors access to high-quality trading algorithms and provides algorithm creators with access to investors at fair prices. Tradingene expects to popularize trading algorithms as an investment product. Tradingene has already created a platform for evaluating and testing algorithms and a database of algortihms and creators. There are over 1,200 different cryptocurrencies in the world today. In 2017, many cryptocurrencies dramatically appreciated and aggregate capitalization of «digital money» exceeded $200 billion by October 2017. The capitalization of Bitcoin (BTC), the most liquid cryptocurrency, exceeds $100 billion and surpassed that of largescale financial holdings such as Goldman Sachs ($92.9 billion) and Morgan Stanley ($89.1 billion)2. The market has many alternatives to Bitcoin (“BTC”), many providing opportunities for returns no less interesting or promising than BTC. It’s no surprise that these new assets and their impressive growth have triggered the emergence of cryptocurrency exchanges that have, in turn, attracted large and growing numbers of investors eager to profit from the volatile markets of cryptocurrencies. This has led to an increase in access to and liquidity on cryptocurrency markets. On November 1, 2017, for example, BTC’s daily trading volume exceeded $2.6 billion. New, ambitious cryptocurrencies continue to emerge, adding to the optimism of cryptocurrency traders. MANY LARGE FUNDS, INSTITUTIONAL INVESTORS, AND EXPERIENCED TRADERS USE ALGORITHMIC TRADING (INVESTING THROUGH TRADING ALGORITHMS THAT BUY AND SELL AUTOMATICALLY BASED ON STRATEGIES EXPRESSED IN THE ALGORITHMS). THIS FORM OF TRADING HAS A NUMBER OF SIGNIFICANT ADVANTAGES OVER MANUAL TRADING AND PROVIDES HIGH RETURNS WHICH ARE NOT PRESENTLY ACCESSIBLE TO THE PUBLIC, NOT ONLY ON CRYPTOCURRENCY MARKETS, BUT ALSO ON TRADITIONAL MARKETS. Two questions naturally flow from this: (i) can investments through trading algorithms in cryptocurrency and other popular financial instrument be made available to a wide range of people? and (ii) why hasn’t anyone done this? This White Paper presents the details of Tradingene. We will explain why the answer to the first question is an unambiguous “yes”. And we will explain the existing problems facing those who wish to invest in trading algorithms on both traditional and cryptocurrency markets. We will also present our vision of the solution to these problems and explain the advantages of our platform for both algorithm creators and investors. 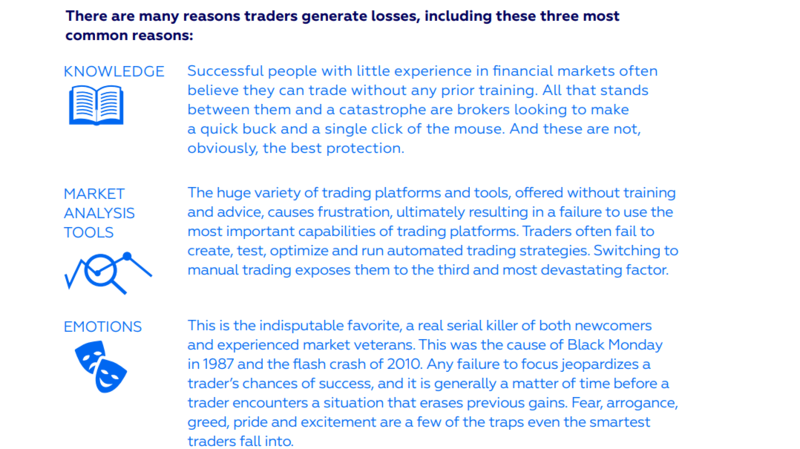 More than ninety percent of traders lose money. Many would say that the reason for this is markets’ efficiency and any actions other than investment in a market portfolio will not result in above-market returns. But this is not the case, since a small percentage of traders regularly generate above-market returns. Is there any way to eliminate these? Yes! The answer lies in algorithmic trading. 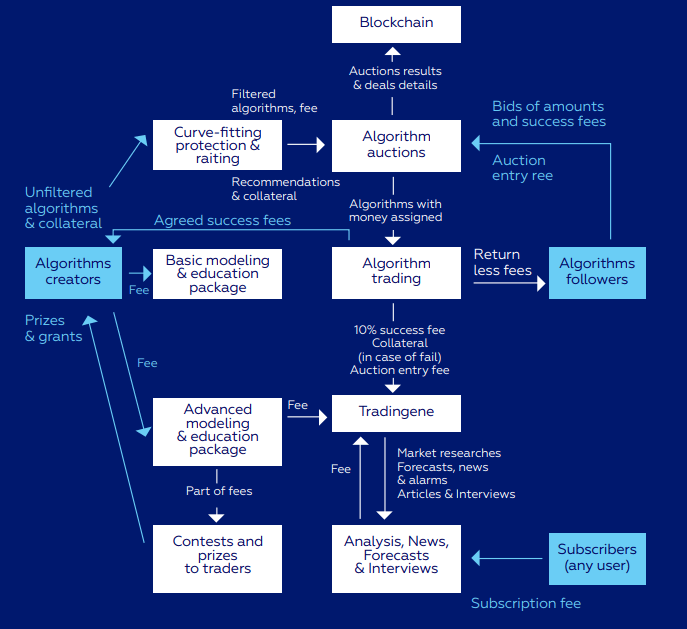 When traders develop trading algorithms, they study (for without market knowledge a successful algorithm cannot be built); they familiarize themselves with the tools available to traders and how these tools can aid in trading; and, most importantly, traders eliminate emotions from trading process: an algorithm doesn’t rush to buy on a tip or panic after a series of loss-making trades. An algorithm is also not prey to euphoria after a profitable trade. To an algorithm, the only thing that matters is the strategy developed by its creator, to which the algorithm must strictly adhere. These are not the only advantages of algorithmic trading. Ed Seykota and Perry Kaufman are prime examples of successful investors who use trading algorithms. Furthermore, hedge funds, such as Bridgewater, Citadel and Two Sigma Investments use trading algorithms and are amongst the most profitable funds globally. Despite the advantages of algorithmic trading, the increasing liquidity and capitalization of digital currencies, and the high technical competence of cryptocurrency market participants, algorithmic trading hasn’t yet taken over cryptocurrency investors or markets. The emerging cryptocurrency market has numerous imperfections that have prevented algorithm creators and investors from interacting successfully. Those imperfections include the absence of standardized APIs and high transaction costs. Also, algorithm creators do not have access to high-tech environments for developing and testing strategies nor do they have effective mechanisms for fund-raising. And investors lack access to investible trading algorithms. Our project aims to solve these challenges. We are traders. Many members of our team have been trading for years, experiencing ups and downs, euphoria and disappointment. We have adhered to different strategies and methods, but to one dream: to abandon manual trading in favor of algorithmic trading. In the pursuit of our dream we encountered one fundamental problem – retail investors do not have affordable access to investible trading algorithms. That’s why in 2015 we decided to develop our own product – the Tradingene platform. TRADINGENE IS A BLOCKCHAIN-BASED PLATFORM DESIGNED TO BRING ALGORITHM CREATORS AND INVESTORS TOGETHER ON AN AUCTIONBASED MARKETPLACE AND TO SATISFY INVESTORS’ AND CREATORS’ KEY REQUIREMENTS. OUR GOALS ARE: (I) TO PROVIDE QUALITY OPPORTUNITIES TO RETAIL INVESTORS WHO WISH TO INVEST USING TRADING ALGORITHMS; (II) TO PROVIDE ALGORITHM CREATORS WITH OPPORTUNITIES TO DEVELOP, TEST AND SELL TRADING ALGORITHMS; AND (III) TO CREATE THE CONDITIONS FOR MAXIMALLY EFFICIENT, TRANSPARENT AND PROFITABLE INVESTMENT IN TRADING ALGORITHMS. Our team has achieved remarkable results in our three years of product development. We have attracted more than 300 algorithm creators from leading global universities, mathematicians and programmers experienced in creating trading strategies, and actively collaborated with them in developing our product. To date, over 2,000 algorithms have been developed and tested on our platform. Tradingene is ready for use by algorithm creators. In the coming years, we will grow and improve our trading platform and perfect its capabilities for optimizing trading strategies. We have developed an AI-driven system that evaluates and rates algorithms, which will simplify the selection of appropriate algorithms by investors. Algorithm creators are provided assistance in determining appropriate success fees, allowing them to attract capital at an optimal price. Furthermore, Tradingene has developed a unique online course “Exchange Trading using Machine Learning.” The course teaches any user with advanced skills in mathematics, statistics, programming or other applied sciences how to create trading algorithms using various exchange instruments, even if the user lacks meaningful experience in financial markets. Over 300 creators have completed the course. The Tradingene platform is based on the most up-to-date and secure protocols, which provides for efficient data exchange between trading algorithms and platform users in real time. The time for investing in crypto has ended, it’s time to trade! Cryptocurrencies attract more and more buyers every day. At the same time, the market may soon reach the point where trading cryptocurrencies, given their high volatility, will be more profitable than investing. This trend is already clear over short intervals. Given increasing liquidity, diminishing spreads and reduced transaction costs, we expect to see substantially more trading activity in the near future. Tradingene is pursuing the ambitious goal of creating an active marketplace for trading algorithms. As our platform develops and improves, we will bring to the market significant innovations: • Access to investing in trading algorithms for retail investors. Access to algorithmic trading on the cryptocurrency market. Free access to an advanced web environment for development and testing of trading algorithms. The opportunity to attract investors directly to trading algorithms. A transparent marketplace that uses blockchain technology and provides the ability to attract capital at prices determined at auction. Popularization of trading algorithms as a popular investment product. Creating and supporting a large community of algorithm creators and investors on the Tradingene platform. Product conception. System architecture development. Test enviroment launch of algorithm creators. Development of the first algorithms. Testing of algorithms filtering and rating system; exploration of feasibility of signal transmission to investor accounts. Connection to stock exchanges. 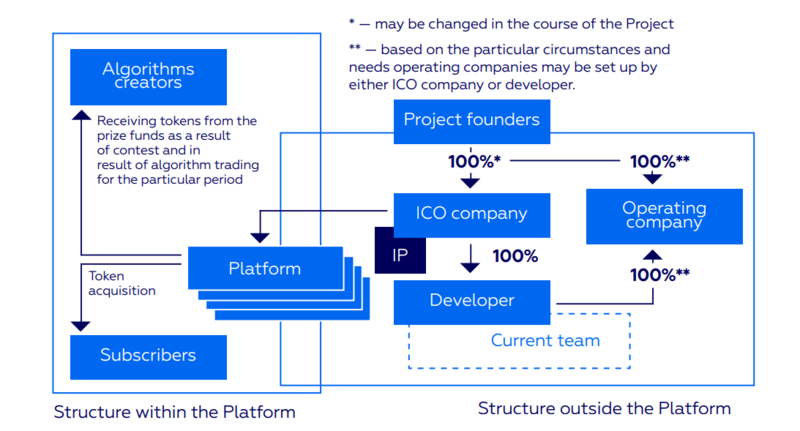 Development of trading platform and the system's core elements. Development of user interface for algorithm creators. Tradingene Timeline Closed Beta-test among the initial algorithm creators. Algorithm programming in Lua language. Application of Machine Learning strategies and development of user interface for algorithm creators. Tradingene public product launch for algorithm creators. Broadening of financial instruments for algorithm creation. Draft documentation for users. Launch of online educational course for algorithm creators. Tradingene Timeline Development of user interface prototype for investors. Introduction of algorithm development in Python, Improvement of beta test environment. Connection to cryptocurrency exchanges. Marketplace and mobile application development. Launch of mobile applications and Telegram bots for investors. Launch of analytic products, forecasts, alerts bots. Launch of Algorithm Auctions with auction results and smart contracts entered onto blockchain. Trading of cryptocurrencies exchanges begins. Connection to stock markets and futures exchanges. Cooperation with other blockchain services for algorithmic processing and algorithm storage. Expansion of opportunities for algorithm purchase and platform-based fund of algoritms creation. Geographical expansion of trade platforms, growth of user base, and broadening of assets tradable by algorithm.